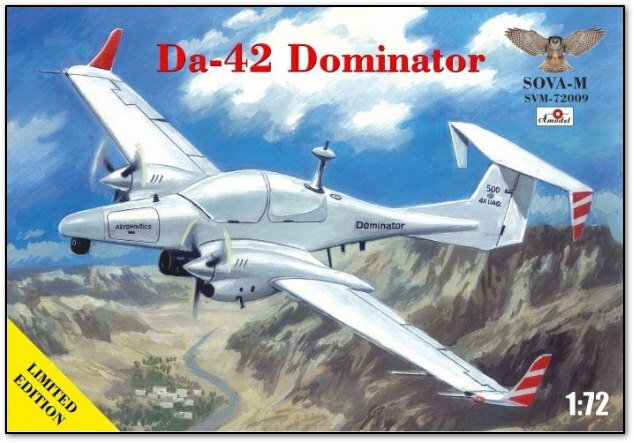 This new kit from SOVA-M showcases the DA-42 Dominator UAV in 1/72 scale! The DA-42 is a twin engine propeller airplane developed by Diamond Aircraft Industries in 2001. It was the first twin engine aircraft to be produced in over 25 years. The Dominator drone type is specifically an Unmanned Aerial Vehicle (UAV) converted from the standard DA-42 because of its incredible diesel fuel economy. Because of its increased flight time of 28 hours, it has been adopted by many countries military's and police forces as a dedicated reconnaissance plane. This kit includes 3 types of decals and will measure about 11.9cm long and 18.8cm wide when completed.